Drum lessons from MD Music tuition in Norwich. 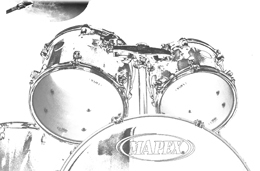 Learn to play the drums in Norwich Norfolk and surrounding areas with MD Music Tuition. Don’t worry if you are a beginner – we welcome all ages and levels of experiance. Dave Hassel & Dave Weckl to name a few!! This will provide students with the tools needed to develop and maintain a structured daily practice routine giving them confidence with set goals, essential in any learning environment. Course objective is to develop students’ abilities using my skills to motivate, encourage and promote the wonderful art of drumming. Lessons are challenging, inspiring and of course fun. Unless you are a complete beginner you are likely to find that you are unsure exactly what level you are playing at. We keep it straight forward and find out what you know , what you want to know and take it from there. To give you an idea of the areas covered, here are some brief level descriptors below, just click on the tabs for information on each level. Fundamental techniques for the drumset, anatomy of the drum kit, some simple “Essential Grooves” to get you started, basic time keeping. So you are comfortable behind the drum kit and can play but feel that you want to learn more? Lessons address issues such as balance around the drumset, listening, establishing an effective practice routine, counting out loud while playing, playing in time, musical influences, rudiment studies to include Single Strokes, Double Strokes - two of the most basic rudiments. At the experienced level you're now, not only feeling comfortable but confident with the sounds you are creating and the music you are making. Your standard of playing is increasing all the time and you are able to learn more complicated rudiments, more complex essential grooves, important issues are: Does it groove? Does it swing? How does it feel? Do you use your metronome as a reference for your desired tempo? These are just a few of the challenges we face as drummers and believe me there are so many more areas that we can study to improve our drumming. At this level you should have a good solid foundation and understand all areas of the experienced level. You are not only confident but have been playing at this level with other people for some time. Lessons include looking at and creating complicated grooves, soloing comfortably, dynamics, exploring different stokes & grips, consolidating your music theory and song structure knowledge. Interpretation of notes in a musical way such that the sum of the parts played is greater in feeling and energy that the individual notes. In other words, anyone can sit at a drum set and play a beat, but a drummer will sit at a drum set and play music.